I’ve already written about how to read EXIF data in the past and I feel like I could expand a bit further on the topic. Your camera phone stores EXIF data in every picture you take and today we’re going to look at what is EXIF data, why it is your friend and how to view EXIF data. EXIF is an acronym for Exchangeable Image File Format and it is used by electronic devices to store additional information in image files besides pixel and color information. EXIF data (or EXIF metadata) allows you to know interesting facts about the settings used by the device to capture an image, like the time and date, the focal length of the lens, aperture settings, shutter speed, ISO speed and even the model of the camera phone used to take the picture. JPEG and TIFF are two popular image file formats support EXIF data and a lot of phones are starting to write EXIF information in image files. 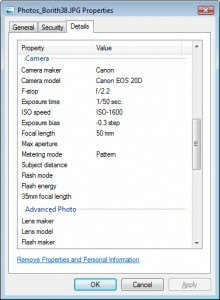 EXIF data is very useful to have if you’re a photographer. You can use it to analyze the settings you used to take your pictures and find out what you did right and what you did wrong in them. 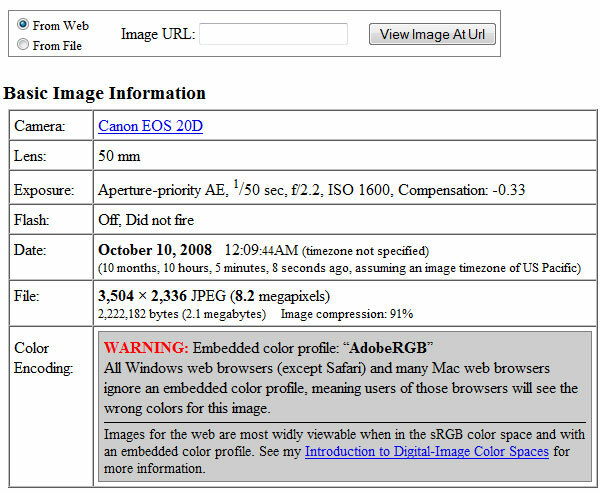 Also, you can often view the EXIF data of pictures uploaded to online photo albums such as Flickr and it can often unveil secrets about which settings a photographer used to take his pictures. If you’re shopping for a new camera phone, you can visit popular online photo album sites like Flickr and Picasa. These websites use EXIF data to categorize photos, and they allow you to search pictures by camera model and you can find a lot of sample pictures from the camera phone you’re planning to buy. EXIF data also allows for Geolocation (or geotagging) if your camera phone supports it, meaning that your pictures will be tagged with the location where you took them, a very useful feature to have when you’re traveling. 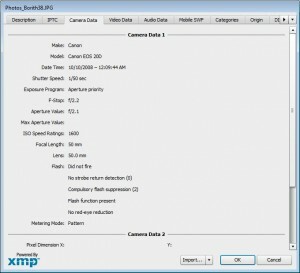 Which cameraphones support EXIF metadata? 1. The iPhone with its average 2 megapixel camera but incredible image management software. 2. The Nokia N95 with its amazing 5 megapixel camera and integrated flash. 3. The BlackBerry Storm 9530 with a 3.2 megapixel camera, integrated flash and auto-focus functionality. 4. The BlackBerry Curve 8330 with its 2 megapixel camera, flash and 5x digital zoom. 5. The Sony Ericsson W580i with its 2 megapixel camera. As you can see in the following graph taken from Flickr, although it doesn’t have the best camera the iPhone is by far the most popular cameraphone on Flickr at the time of this writing. Sometimes you can view EXIF data directly on the cell phone which you used to take a picture. Once the pictures are on your computer, most photo manipulation software will allow you to read EXIF data. For example, in Adobe Photoshop select “File Info…” from the File menu. 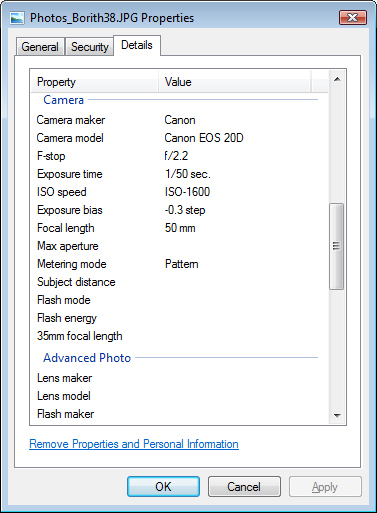 Alternatively, you can view the EXIF data in Windows Vista if you right-click an image file in the file explorer and select Properties. The process is similar in Windows XP, right-click a file and select Properties. In the Properties tab, go to Summary and pick Advanced. 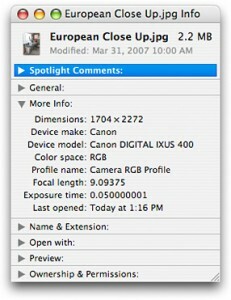 You can also view EXIF data in Mac OS X. Do a Get Info on a file in the Finder, and expand the More Info section. You can also upload your pictures to a web site like Jeffrey’s Exif Viewer which will allow you to view EXIF data without any kind of special software. 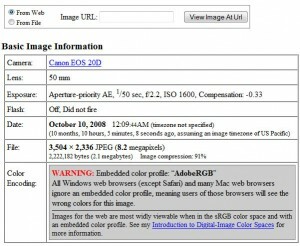 Hopefully this article will have shed some light on EXIF data and how you can view it. 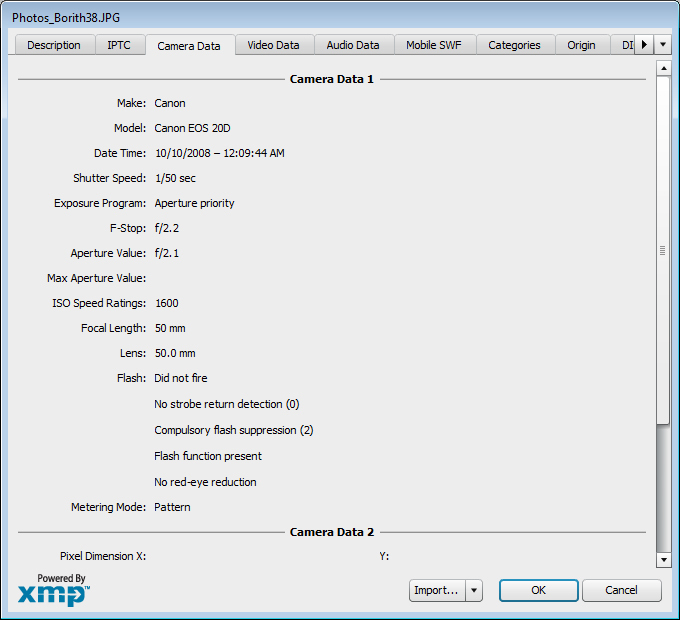 How do you use EXIF data? Share in the comments below!